Coco is full of impressive and colorful visuals as the family-themed film joins the Pixar animation canon. The last time that director Lee Unkrich teamed up with producer Darla K. Anderson, it resulted in the sentimental Toy Story 3. 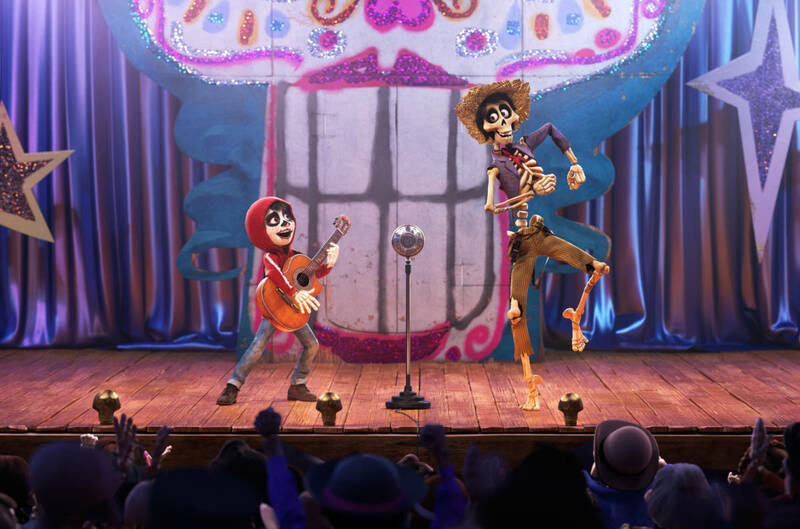 Joined in their efforts by co-director Adrian Molina, Coco is hits along the same emotional tones. The only exception is that rather than nostalgia felt for the Toy Story franchise, the big takeaway from the newest Pixar classic is the importance of family is in addition to the pursuit of one’s dreams. Coco introduces us to Miguel (Anthony Gonzalez), a 12-year-old-kid who could be anyone. He’s full of dreams and idolizes Mexican hero and musical sensation, Ernesto de la Cruz (Benjamin Bratt). There’s just one tiny problem: his family has forbidden him to play any music. The story behind this is that his great-great-grandfather ran out on the family when his wife wanted to settle down and raise a family. Instead, he only wanted to make music. Music wasn’t allowed in the family soon thereafter. Coco has the added theme about family: honoring ancestors by keeping their memories alive. This is the theme that hits the hardest from an emotional perspective when Miguel somehow finds his way into the Land of the Dead. Upon meeting his ancestors, who aren’t fans of music, Miguel runs away in search of de la Cruz, the man he believes to be his great-great-grandfather. Hiding from guards, he overhears the trickster Hector (Gael García Bernal) talking about knowing de la Cruz. Intrigued, Miguel gets his attention and the two go on an adventure to meet his ancestor. Without giving away too much of the plot, it’s during the film’s climax and third act when it starts to really tug at your emotions. Hector has a daughter and he’s afraid that she’s starting to forget him. This means he would completely be forgotten and disappear altogether in the Land of the Dead – it’s important for him that Miguel get a photo to his daughter so that he’s remembered. It’s moments like these that really hit close to home for family members with loved ones or those older family members wondering what their legacy will be. Musically speaking, Michael Giacchino’s score does not disappoint and only adds to complement the original songs. It’s not an all-out musical like Frozen and Moana were but there are a number of original songs throughout the film, including the emotional “Remember Me,” co-written by Oscar winners Kristen Anderson-Lopez and Robert Lopez. Other songs were penned by Germaine Franco and co-director Adrian Molina. While Frozen remains the best film to come from Disney since The Lion King, Coco takes the mantle away from Toy Story 3 for being the most sentimental and Inside Out is up there, too. It’s not only a film for children but also their parents and grandparents–don’t forget the Kleenex as the eyes won’t be dry by the time it ends. Walt Disney Pictures and Pixar Animation Studios open Coco in theaters on November 22, 2017. Olaf’s Frozen Adventure, the 21-minute short film that precedes Coco, was not screened for the press.